Pillowcase There are 5 products. 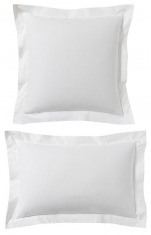 Pillowcase percale, 200 TC, 100% long-staple combed cotton. Easy Care treatment for easy cleaning. Colorfast dye and fade-resistant over time. Stitch finishing, tone on tone on pillowcases. 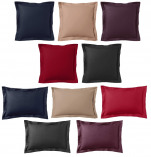 Pillowcase 65x65 or 50x75 cm, 40% microfiber polyester, 40% microfiber modal and 20% cotton. Soft, natural and fluid. Washing 60°C, ironing superfluous (useless), ultra fast drying. Sober and refined finish of multi bite on pillowcases.